Celtic weddings are taking place in many countries across the world, as more and more people are rediscovering their Celtic heritage. Many of you want to create a wedding theme that encapsulates your Celtic roots, whether these connections are in the brides family, or the bridegrooms. Couples today want to create a wedding day so special, that the memories will stay with them their entire lives. I can think of no better way of doing this than having a Celtic wedding. Such a wedding naturally requires the bridegroom to be wearing Highland Dress, but why stop there? why not the best man, the father of the Bride and as many of the male guests as possible. And if you find that your budget doesn't stretch far enough to buy the kilt outfit, then you can always opt for wedding kilt rentals, as a less expensive option. With such weddings you can allow your imagination free reign, for example, why not use the same tartan as the grooms kilt woven into a silk sash, for the brides dress. I have also seen silk tartan sashes made into bows, as finishing touches to the bridesmaids dresses. Or if you want to go all the way, then consider wearing a tartan wedding dress, which I guarantee will really turn heads. On a personal note, my wife and I had her wedding dress maker use some tartan left over from making my kilt, and some of the material left over from her wedding dress, to make a cushion on which our rings were placed for their blessing at our wedding ceremony. Such attention to detail really does help create a more personal feel to your wedding, and you end up with a cherished keepsake. The music chosen to accompany the bride down the aisle, is almost invariably bagpipe music and the choice of CD's is vast. But if you prefer you can do as my wife and I did, and hire the services of a wedding piper this adds a real sense of occasion to your wedding. You can have your rings made in traditional Celtic design, which again reinforces your Celtic heritage. Whatever you or your wedding designer decide to do, choosing a Celtic theme for your wedding, will ensure a day that will live on in your memories forever, and help strengthen your sense of heritage. 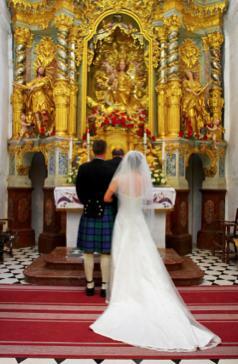 And I trust that you will both have as much fun on your wedding day, as my wife Heike and I had on ours.